The great man, Doctor Samuel Johnson liked cats and, it seems, animals in general. He is the person who single handedly compiled the famous A Dictionary of the English Language1. He was commissioned to write the dictionary because at the time (the 18th century) dictionaries were poor. It took him 9 years and he was paid roughly £230,000 in today’s money. He kept at least three cats over his lifetime. However, Hodge was the only one mentioned by James Boswell in his book Life of Johnson – considered to be one of the finest biographies ever written. From this book we can get an idea of Hodge’s appearance and how he interacted with his human companion, Dr. Johnson. 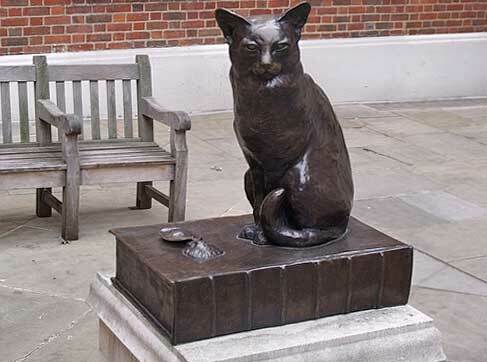 So it seems that Dr Johnson liked other cats, of his, more. Hodge was a black cat being described as having, “sable furr”. The statue of Hodge shown in the photographs below was erected in 1997. Hodge sits on Johnson’s Dictionary. Also on the dictionary is an oyster, Hodge’s regular cat food treat. The efforts of Mrs. Ann Pembroke, Deputy, Corporation of London representative. Dr. Johnson’s House Trust are gratefully acknowledged in the ability to associate this memorial with Dr. Johnson and the English language. (note: it appears that the word “author” was spelled differently in those day). Mrs Ann Pembroke was involved in the process of the erection of this statue. The statue is in Gough Square, now a pedestrianized street and close to the house where Dr. Johnson lived from 1748 to 1759. He lived in many houses in London. 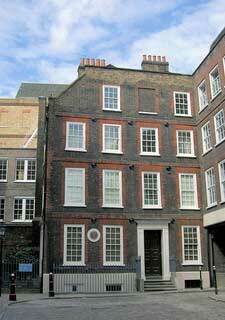 This is the only one remaining today (2012) and where he wrote his famous dictionary. Dr. Johnson had a black manservant named Francis Barber, who inherited Dr Johnson’s estate on his death. Oysters were a commonplace food in the 18th century. Dr Johnson bought them at market himself rather than give the task to his manservant. He thought it would be degrading for Mr Barber to carry out that task. Dr Johnson bought the best Whitstable oysters. The interesting thing about feeding Hodge with oysters is that it was a very good cat food at a time when I am sure cat food was not always that good. Clearly Dr Johnson was a very compassionate and thoughtful person. He seems to have been slightly out of step with the general view about keeping domestic cats at that time. His concern for Hodge and his other cats is shown in the fact that he bought valerian as a palliative when Hodge was dying. Valerian is like catnip. Notes about A Dictionary of the English Language. Lexicographer: ‘ a writer of dictionaires; a harmless drudge’. Clearly a self effacing reference to himself. This entry was posted in Celebrities and tagged celebrities and their cats, Dr Johnson, Hodge by Michael Broad. Bookmark the permalink.